"Their work is versatile and evoked moods from playful to intense. They demonstrated pinpoint timing and an innate sense of balance between the two instruments. They played with both sensitivity and intelligence...Their performance was inspired and captivating." Peter H. Bloom, flute, alto flute, bass flute and piccolo; and Mary Jane Rupert, piano and harp (the Duo "2") have garnered consistent acclaim for creative programming and compelling performances of repertoire from the great works of the European masters to the stellar new pieces of today's composers. Bloom and Rupert are known especially as champions of American music. They have concertized together for 25 years, appearing in venues across the globe, with CDs on North Star, Navona and Ravello Records. "2" is a member of the New England States Touring Roster and the South Carolina Arts Commission's Artists in Education Roster. The Duo "2", live in concert, performing Sonata for Flute and Piano by Bohuslav Martinu (Allegro moderato, excerpt). To play, hover just to the right of arrow until it turns blue, then click Play. The Duo "2" performs a concert called Four by Two. Watch an excerpt from Sonata in Eb Major, BWV 1031 by J.S. Bach (Allegro). Mary Jane Rupert, piano and harp, praised by The New York Times as exhibiting "indeed real sensitivity," has performed throughout the world from Carnegie Recital Hall to the Beijing Concert Hall. She has appeared as concert pianist and harpist with chamber ensembles, choral groups and orchestras across the United States, including the Record Players, Musica Sacra, Cecilia Society, Silverwood, Masterworks Chorale, the Boston Philharmonic, the New Hampshire Symphony, Boston Classical Orchestra and New Philharmonia. She serves on the faculties of Boston College and Tufts University. 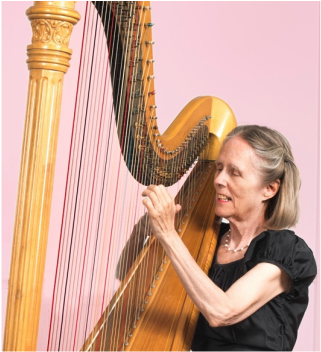 Previously, she held teaching positions at Missouri Western College, Western Michigan University, MIT, and Wellesley College, where she taught harp for 20 years. Dr. Rupert's recordings can be found on the North Star label and Harmony Hill. Her arrangements of the Nutcracker Suite for Flute and Harp and Flute and Piano are published by Noteworthy Sheet Music. A graduate of Oberlin College and Indiana University, she earned a BM in piano performance, Masters Degrees in both piano and harp, and a doctorate in piano performance. Her principal teachers were Gyorgy Sebok and Lily Dumont (piano), and Marcel Grandjany (harp). Photos: Matt Samolis, Will Chouinard, Heloise Tanglewood. Peter H. Bloom, flute, concertizes in the U.S., Canada, Europe, Asia, Australia and New Zealand; appears on 45 recordings; and is a winner of the American Musicological Society’s Noah Greenberg Award. The Boston Globe called his playing “a revelation for unforced sweetness and strength,” while Allaboutjazz.com praised his “hip, jazzy flute work…exquisite melody.” An active recitalist and chamber musician, he has performed for The National Gallery in London, Animusic Portugal in Braga, New Zealand School of Music in Wellington, University of Canberra College of Music (Australia), Sydney & Southern Highlands Music Society (Australia), Payap University in Chiang Mai, Goethe Institute in Bangkok, The Metropolitan Museum, Atlanta's Spivey Hall, The New York Flute Club, The Bach Festival Society of Winter Park Florida, and the National Gallery of Canada in Ottawa, among others. He is also a noted jazz artist, veteran of the internationally acclaimed Aardvark Jazz Orchestra (46th season). He has given lectures and master classes across the globe and has served as historical performance consultant to The American Museum in Britain, The New-York Historical Society, and Boston’s Museum of Fine Arts, where he performs and lectures regularly. Mr. Bloom is contributing editor for Noteworthy Sheet Music. He holds an MM with distinction in flute performance from New England Conservatory and a BA (philosophy) from Boston University.